Welcome to the First Annual OpenSimulator Community Conference 2013! Welcome to the first day of the first annual OpenSimulator Community Conference 2013! We have an exciting program lined up, with great keynote presentations, breakout sessions, social events, and plenty of Expo regions to explore, and we look forward to seeing you in-world on the conference grid over the next two days! Explore the full Conference Schedule online or check the Map & Schedule kiosks when you get in-world. Registered speakers, sponsors, staff, and attendees can download the OSCC Viewer and log into the conference grid with the username and password that was emailed to the address you used when you registered. If you requested a local account and have forgotten your password, please use the Forgot Password link, otherwise review the Login Instructions to connect to the grid and start exploring the conference venue. When you log into the conference grid for the first time, be sure to accept the Terms of Service pop up or you will be disconnected from the grid in 10 minutes! If you miss the pop up, you may need to teleport to another region to trigger the notice again. When you log in, you will land on your designated Landing Zone region 1, 2, 3, or 4. Check the rotating banner in your Landing Zone to see the corresponding Keynote region that you should use for keynote presentations. You will only be able to access the Keynote region that matches your Landing Zone unless you are a presenter. See the Online Map for an overhead view of the conference grid. The Landing Zone regions are social areas with plenty of great places to explore. Be sure to check out the Clothing Shop to customize your avatar, or take a quick trip to the HyperGrid Hub and use the portals to visit our Sponsors’ grids for even more shopping and exploring. Just be sure to make it back to the conference grid in time for the program! The Landing Zone regions also contain an Overflow Video area for viewing the conference streams if the Breakout Zones fill up and you can’t get in. When you arrive at a Breakout Zone or Keynote region please sit in a chair ASAP during the sessions! The conference grid will perform best if everyone takes a seat in the presentation areas. All of the conference presentations will take place in the Breakout Zones and Keynote regions via parcel streaming media. In-world voice will be disabled in those areas, so please use text chat for socializing, networking, and asking questions of the speakers. The conference would not have been possible without the financial support of our Sponsors, so please be sure to visit their exhibits and booths in the Expo Zones to thank them for sponsoring the conference! Explore six regions of terrific booths and fun activities provided by our sponsors – and invite your friends who didn’t get a conference ticket! 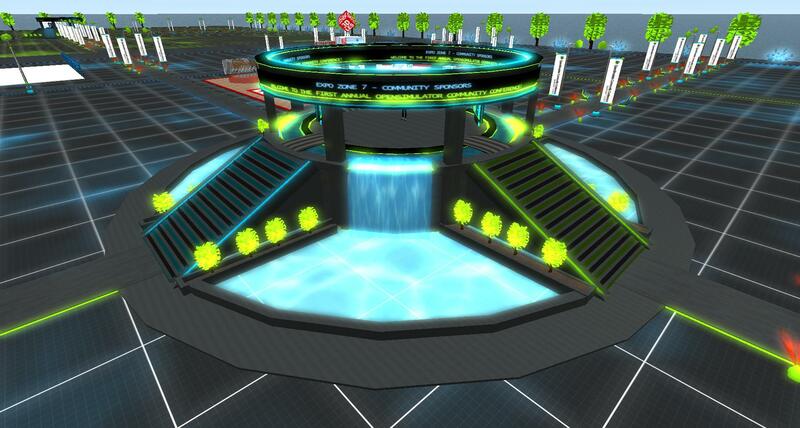 The Expo Zones are open to public hypergrid visitors! Although we hope everything goes smoothly, it is always possible for there to be technical difficulties during the conference program. If this happens, we appreciate your patience and understanding while we work to resolve the issue. If you are disconnected from the grid, please wait a moment or two, check the conference Twitter stream @opensimcc for updated information, and then try to log back in. We will do our best to resolve issues quickly and stick to the conference schedule. No matter what happens, we’re sure the day will hold plenty of surprises! A tremendous thank you to all of our speakers, sponsors, volunteer staff, streaming team, and attendees! We hope you enjoy the conference program and we’ll look forward to seeing you in-world! Conference Kick-Off Final Load Test Today at 12PM PDT! 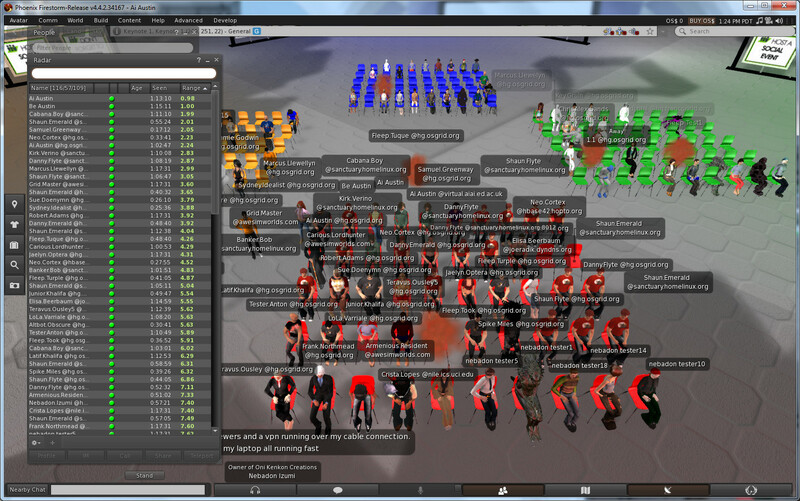 Welcome to the final kick-off load test of the OpenSimulator Community Conference 2013! Today we will be hosting the last load test before the conference, inviting the OpenSimulator community and conference attendees to join us for one last opportunity to kick the tires of the conference grid before the start of the conference on Saturday! Previous load testers should note that access controls have been turned on on the conference grid, so we’re asking everyone to teleport to the main conference grid URL of http://cc.opensimulator.org:8002 so we can test the routing and access control mechanisms. When you arrive on the conference grid, you should land on the Expo Zone 1 region, and then as long as you are a member of the OSCC Load Testers group, you should be able to teleport over to the Keynote regions. If you aren’t a member of the OSCC Load Testers group, just do a search for groups and join to participate in the load test. Full login instructions for attendees can be found on the Login page, and for others who wish to participate, see the instructions below. Our many, many thanks to all of you who have helped with load tests over the past few months, we’re looking forward to a terrific conference – thanks to you! OpenSimulator Community Conference Planning Update – Last Call for Sponsors, Volunteers Needed! A quick update on the OpenSimulator Community Conference 2013 planning since we’re now less than a month away! We’d also like to thank everyone who has signed up as a sponsor! A friendly reminder that the deadline for all sponsor artwork and builds is 8/15, so if you haven’t gotten started yet, now’s the time to do it. Submit your logo artwork and be sure to review the Expo Booth Building Guidelines. This is also the last chance for anyone who wants to be a founding sponsor of the conference to sign up, so if you’re on the fence, please do take a look at our Call for Sponsors page. The community sponsorships are as low as $50, and all proceeds go towards the cost of the conference grid and web services needed to run the event. We’re still short on our estimated budget, so every bit helps and the sponsorships are tax deductible for US residents and companies, too! We also desperately need more volunteers for the Greeter, Moderator, and Streaming teams. Our goal is to stream and archive every session of the conference, but if we don’t have enough people to help do that, we’ll be forced to pick and choose which sessions to stream. As a bonus, volunteers get an in-world ticket to the conference, so you can hang out and enjoy the rest of the event after your volunteer shift is over! Please do sign up to help volunteer if you can, we really appreciate the help! Last but not least, the Social Events schedule is starting to get sign-ups, but there’s plenty of slots still open. This is a great way for you to showcase your grid or projects if you don’t feel like doing a formal presentation. Just sign up to host a social event on your own grid and after the day’s breakout sessions are over, conference attendees can come visit and check out your space! Our many, many thanks to all of you who are already helping with the conference, whether you’re load testing, bug fixing, building, speaking, sponsoring, or helping in some other way, this is shaping up to be an awesome event! Thanks and more to come soon as we start finalizing the schedule..
Special Conference Grid Load Test Scheduled for Saturday, August 3rd! Load test on July 23, 2013, image courtesy of Austin Tate’s Informatics Blog. Calling all OpenSimulator avatars!! A special large-scale load test of the conference grid is scheduled for Saturday, August 3rd at 10AM PDT. We need members of the community to help push the conference grid to its limits to test the capacity and performance of the simulator software and hardware prior to the first annual OpenSimulator Community Conference! If you find that the first region you try is full please use the next address on the list and so on. For the purposes of this load test, feel free to log in with multiple avatars, but please do not use bots, pcampbots, or other various libomv based viewers since we are trying to test the conference grid under conditions as close to the actual conference as possible. We recommend a Third Party Viewer that can support voice and mesh, such as Singularity, Firestorm, or Kokua. 1. Create an account on OSGrid at http://www.osgrid.org/index.php/auth/register. 2. Download a TPV viewer supported by OSGrid from http://www.osgrid.org/index.php/downloads and log into your account. Thanks in advance for your help and we look forward to seeing a big crowd on Saturday! The OpenSimulator Community Conference 2013 will open on Saturday morning, September 7, 2013, with a keynote panel of core developers, who will discuss the future of the OpenSimulator platform. 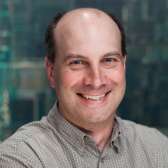 Topics will include a variety of issues including the future of the Hypergrid, content licensing and permissions, relationships with Linden Lab, third-party viewers, scalability, project maturity, and much more. Expect a lively debate! Be sure to register for the conference, including streaming of all keynote speakers, today! 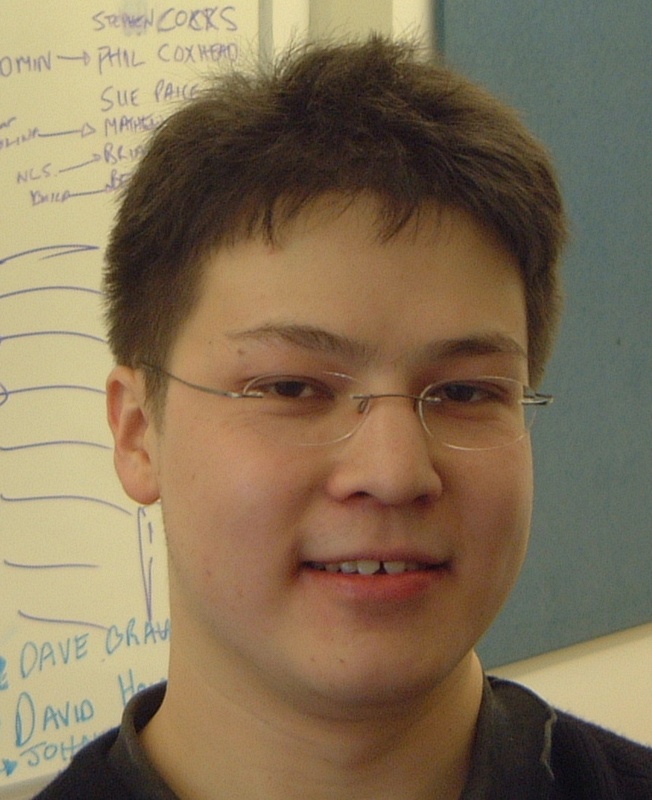 Grady is internationally recognized for his innovative work in software architecture, software engineering, and modeling, and is perhaps best known for developing the Unified Modeling Language (UML) with Ivar Jacobson and James Rumbaugh and helping originate the term and practice of object-oriented programming and design. 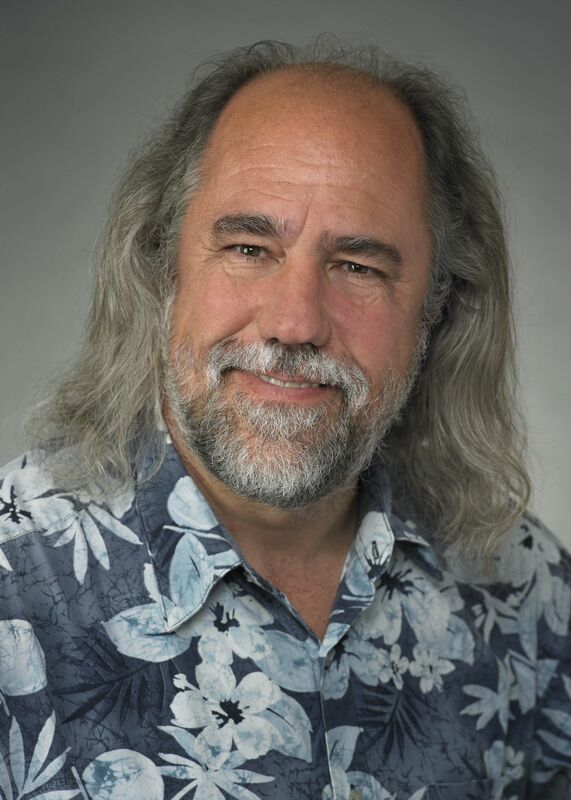 An IBM Fellow, ACM Fellow, IEEE Fellow, and recipient of the BCS Lovelace Medal and Turing Lecture, Grady is the author of numerous best-selling books and technical papers, including the UML Users Guide and the seminal Object-Oriented Analysis with Applications. 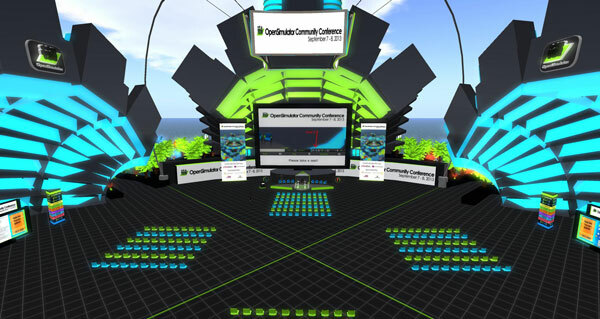 Hi folks, we are planning a large-scale load test of the OpenSimulator Community Conference grid on Tuesday, July 2, 2013 at Noon PDT and we need members of the community to help push the conference grid to its limits to test the capacity and performance of the simulator software and hardware. Anyone interested in the conference or the OpenSimulator software is welcome to participate in the load test by making a jump from any other hypergrid enabled OpenSimulator grid. The focus of this load test will be fitting as many hypergrid participants on the keynote regions of the conference grid as possible. Thanks in advance for your help and we look forward to seeing a big crowd on Tuesday! Update: In-world venue tickets are currently sold out, but the conference sessions will be streamed via UStream. In the event that we can make more in-world spots available, we will offer those places to people who have registered for Streaming on a first-come, first-served basis, so be sure to register for a streaming ticket! Registration for the in-world OpenSimulator Community Conference is now open! Due to the “alpha” nature of the OpenSimulator software, this conference is an experiment in capacity testing for OpenSimulator in addition to being a community event. Therefore, tickets to the conference will be free but limited in number. We hope to be able to accommodate over 200 users in total, a figure which includes speakers, sponsors and staff . Since seats are limited, registration will open on a first-come-first-served basis until the maximum number of virtual conference center tickets is reached. At that point, community members will still be able to register for the live streamed version of the conference that will be available via UStream. This will also be free. Sponsors, speakers, staff members, and volunteers should not register for a regular Attendee ticket. Instead, please use the promo code provided to you. See the Quick Links to the right to find out more information about becoming a sponsor, speaker, or joining the conference planning team! The OpenSimulator Community Conference is seeking speakers, presentations, and research papers for the inaugural annual conference event, scheduled for September 7 – 8, 2013. The conference will take place entirely within an OpenSimulator virtual world designed specifically for the event, and will feature six topic “tracks” to showcase community activities and projects. The Arts & Creativity track will celebrate the diversity of artistic and creative endeavors on OpenSimulator grids. This can include large scale immersive art installations, ballet, theatre, performance art, machinima, literary arts, clothing designs, virtual fashions, architecture, music performances and other cultural expressions. The Business & Enterprise track will feature sessions that cover a broad range of uses related to doing business in and with OpenSimulator, including grid hosts, third party developers, private entrepreneurs, in-world and enterprise businesses, as well as corporations and organizations using OpenSimulator for marketing, fundraising, product research, focus groups, and more. The Developers & Open Source track covers topics of interest to OpenSimulator developers, including developers of third-party modules, viewer developers, applications that run in and along side OpenSimulator, Hypergrid systems developers, as well as the more technical details of content creation including 3D modeling, mesh, physics, NPCs, and emerging technology tools that help make OpenSimulator tick. The Education track will feature sessions that cover a broad range of uses related to teaching and learning in and with OpenSimulator, as well as how schools, colleges, and universities are using OpenSimulator in their day-to-day work, from designing virtual campuses and classrooms, to integration with other campus systems, marketing and outreach, and much more. The Research track will explore the ways in which OpenSimulator has become a laboratory for research in a wide range of areas, from computer science and engineering to ethnography and economics. Please see the research track submission web page for details of the style of submissions and the papers requested. The Social & Communities track will explore all the ways in which OpenSimulator offers communities for nearly every interest, from role playing groups to science fiction communities, to virtual towns and interest groups, historical explorations, religious and spiritual communities, book clubs, and so much more. This track will feature sessions that focus on sharing about and improving the social experience and overall community of OpenSimulator users. To submit a proposal, visit the appropriate track page and be sure to review the specific guidelines for that track, as each track may have different requirements. Note that proposal submissions are due on July 1, 2013.